All over the world, donated medical equipment is rusting away in fields—some having never been used at all. Homes have been built in developing countries that people do not live in. Despite billions of dollars in Western aid, 10.9% of the world is still living on less than $2 a day. Steve Corbett and Brian Fikkert’s When Helping Hurts: How to Alleviate Poverty without Hurting the Poor… and Yourself, is an honest examination of good intentions and unintended consequences. Corbett and Fikkert articulate the problematic aspects of poverty alleviation efforts in the past, present, and what can be done to do better in the future. When it comes to poverty alleviation, it matters where you start. Beyond the material poverty of underserved communities all over the world (particularly rural, hard-to-reach places where Lifewater serves) is the spiritual, social, and psychological poverty that so many people are experiencing. If we see that someone needs a house, but do not address that they’re experiencing feelings of inferiority, simply building them a home might exasperate their negative feelings. They may even see their newly built home as a picture of deep shame. When we remember that God designed human beings to live with health on each of these fronts—spiritual, social, systematic, psychological, and material—our poverty alleviation efforts become much more comprehensive and lasting. It’s time we make a shift in mindset about poverty alleviation. It’s time to reconsider our efforts. Perhaps material poverty, the lack of a home or shoes or even water, is a symptom and not the underlying problem. A local man takes part in his community’s development. “It is this lack of freedom to be able to make meaningful choice—to have an ability to affect one’s situation—that is the distinguishing feature of poverty,” the authors stated (67). If the inability to make meaningful decisions is the common root of poverty around the world, then churches, nonprofits, and humanitarian organizations must turn their efforts to empowering the poor in all they do. The purpose? Minimize harm and maximize long-term impact. According to Corbett and Fikkert, the way to avoid this is participation. “Like all human beings, poor people are more likely to have a sense of enthusiasm for an ownership of a project if they have been full participation in it from the very beginning,” they said. “When the project is ‘theirs,’ they are more likely to sacrifice to make it work well and to sustain it over the long haul” (136). When people take ownership of their own progress, they experience increased feelings of worth, potential, and a dedication to see it through. Not only that, but listening to the knowledge and cultural characteristics of those you’re serving provides a benefit too often overlooked. “The knowledge and skills of the insiders—the materially poor themselves—are vital to getting things done and to making things work well” (136). Listening to people shouldn’t be a novel idea. But, in all our good intentions, many people get focused on what can be done for people and forget to listen to what they have to say. What we can do together might serve them more than we, by ourselves, ever could. 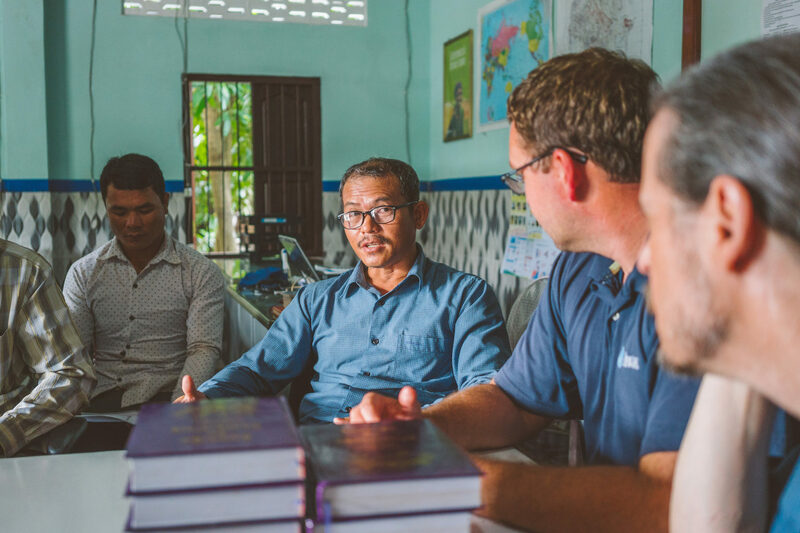 Cambodia staff share their experiences with Lifewater President/CEO Justin Narducci. “The goal is to see people restored to being what God created them to be: people who understand that they are created in the image of God with the gifts, abilities, and capacity to make decisions and to effect change in the world around them,” they said (77). To do this, anyone who seeks to serve must take a look at themselves, their motivations, and their processes. Coming face-to-face with our own shortcomings and realigning our worldview to be more kingdom-minded helps us help others. At Lifewater, we practice an asset-based form of community development. It focuses on getting to know communities, asking them what they have to offer themselves, and teaching them how to improve their lives in areas they have identified as priority. Although development is the key practice here, there are times when relief is the appropriate solution to a problem. When a hurricane strikes, or when there are a large number of displaced peoples, immediate action and aid is the right answer. But for the most part, all poverty alleviation strategies should be highly participatory, utilize local assets, and address community-identified needs. When relief efforts aren’t applied well, or are applied in the wrong circumstances, you may actually be doing more harm than good. Corbett and Fikkert cite work as a form of worship. They say, “Relief efforts applied inappropriately often cause the beneficiaries to abstain from work, thereby limiting their relationship with God through distorted worship or through no worship at all” (109). This might be a stack of rocks or bricks on the other side of the village that can be used to help construct a concrete wall around a water source. It could also be their own two hands, providing labor for the construction. 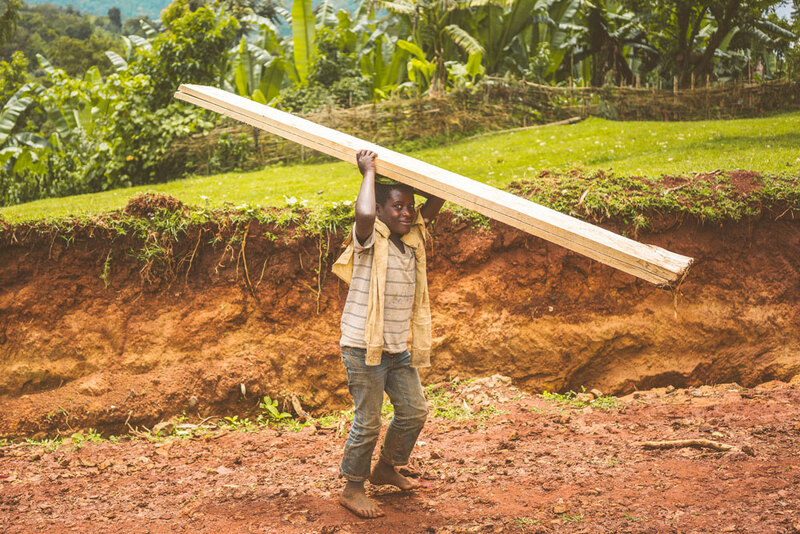 A boy carries materials to his village to help construct a fence around their new well. “One of the biggest mistakes that North American churches make—by far—is in applying relief in situations in which rehabilitation or development is the appropriate intervention” (101). Rather than doing projects for the economically poor, it’s vital to “seek solutions together with them,” they said (135). Participation in sustainable transformation addresses both the material poverty and the poverty of being that Fikkert and Corbett address in When Helping Hurts. People have more enthusiasm for something that they’re actively working towards. They have a stake in whether or not it lasts. Real, lasting, God-breathed change happens when staff and empowered communities work together to solve their most pressing problems. Teach five healthy practices. Our local staff work house by house teaching simple yet life changing healthy habits. Healthy practices include: drinking and storing clean water, building an improved restroom, practicing proper hand washing, crafting a drying rack for dishware, and keeping the area around the home swept and free of rubbish. All activities that families can accomplish on their own. Hire in-country staff and health promoters. Rather than send North Americans to rural Uganda, Ethiopia, and Cambodia, we hire in-country staff and health promoters, believing that national staff are always the most knowledgeable, culturally-aware, and effective. Refuse to bring in outside resources. 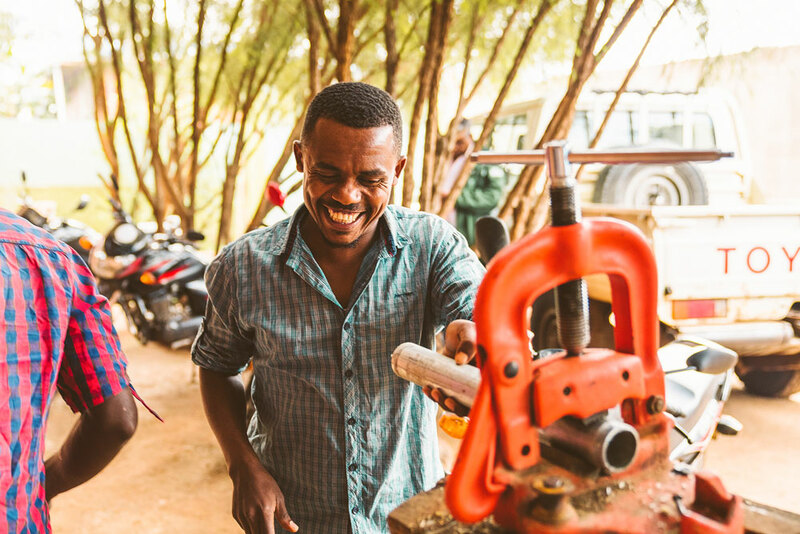 Every construction supply, tool, and machine—except large assets such as Bill the Drill—is resourced in-country. We also connect communities with public-works systems so that the water source can have local access to repairs should it ever need them. This helps stimulate the local economy and helps Lifewater steward donor contributions responsibly. Require community contributions. Each village or parent-teacher alliance must supply 10-20% of the cost of their safe water source or school bathroom project. This can come through labor, materials, or a monetary amount. Research proves that community development is successful when communities themselves have sacrificed to make it work. This village savings model is easily replicable for the communities to accomplish additional endeavors. Establish Water Committees. Water committees are an authoritative social structure in a village. They are respected leaders nominated by the village members, and they are responsible for collecting user fees to put in a savings account for future repairs. They also manage the daily functionality of the water source. “I am deeply encouraged by how Lifewater International has taken the principles in When Helping Hurts and applied them to create a relational, long-term, asset-based, Christian clean-water charity,” Fikkert said. At Lifewater, we’re committed to intentionality in every aspect of our programs. Participation in sustainable transformation addresses both material poverty and poverty of being emphasized by When Helping Hurts. It allows communities to engage in their own transformation, to recognize their own potential, and to thrive as God intends.